My husband N loves sausages almost more than life itself, and probably slightly more than me and our baby. If he’s not eating sausages, he’s thinking about when he can next eat them. He takes his sausage-worship to almost evangelical heights – not only does he have selected friends that he talks about sausages with in great detail (stop tittering at the back) but he’s now taken it upon himself to make his own bangers at home, using a meat grinder that his sister gave him for his birthday, that of course came with a special sausage attachment! You have to be serious about sausages to want to make them, as it’s a loooong laborious process. For starters, you have to order hog casings from a specialist on the internet. (There are sites that actually sell these kinds of things!) The slippery looking casings are basically pig intestines stored in salt, which need soaking in water for 2 hours prior to sausage making. 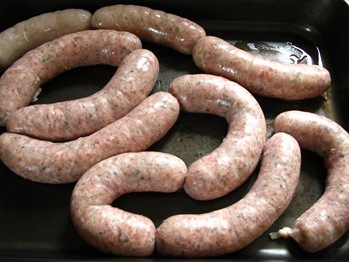 Then you have to peruse various sausage recipes and pick the type of bangers you want to make. 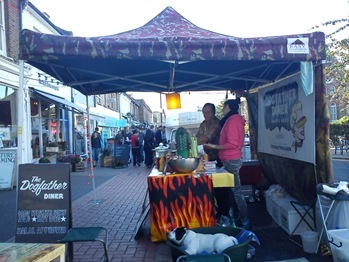 Then it’s off to the butcher to buy a tonne of pork belly and pork shoulder meat, then you have to sort out your seasonings – for example, fresh herbs and spices and salt. After this, you come home and chop the meat into dice, before chilling it for two hours. Then you grind the meat into mince, prepare your seasonings, then mix everything together. Now you’re ready to push the hog casings onto the mincer’s sausage attachment, then squeeze the meat mixture into it (it’s hard not to think of condoms when you do this!) and then watch your sausages come out. It’s really fun to do, but quite a palaver – you totally need an entire day! 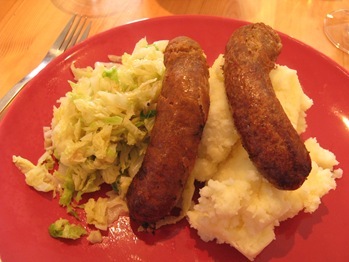 For what are bangers without mash? 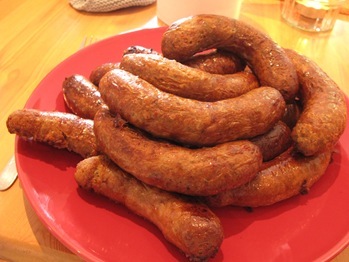 Pre-soak your sausage casings for 2 hours. Chop the meat into small chunks, then put in the freezer for 45 minutes, which makes mincing easier. 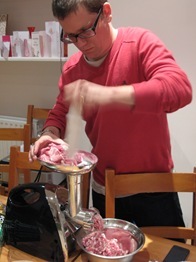 Then feed it through the mincer. Mix in the liquid and flavourings by hand until you have a sausagemeat consistency. 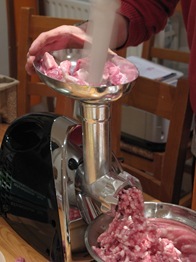 Then feed the mixture through your mincer and sausage stuffing attachment into your hog casings, making sure that once the mixture nearly reaches the end of the tube that you have tied a knot in the casing. 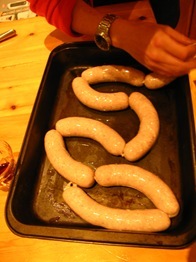 Pinch the sausagemeat at each place where you want your sausages to begin and end, then twist four times to create the divisions. Voila, you have created sausages! Chill them in the fridge for 24 hours to develop the flavour and texture, before cooking in the oven at 180C for about 40 minutes, or until nicely browned. We took inspiration from here and here. 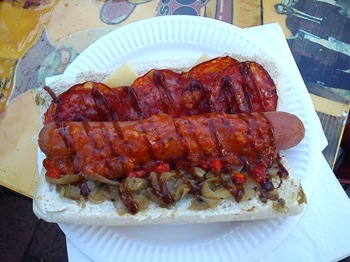 The ‘Boss Hogg’: beef dog, chorizo, onions, red pepper sauce – mmm savoury goodness! 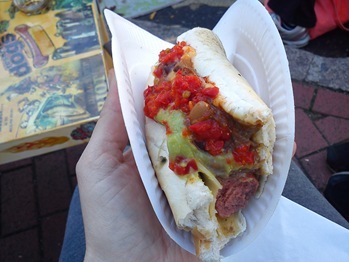 ‘The Mexican’ – beef dog, guacamole, cheese, hot sauce, beans, peppers, onions – arriba!